djkardkreations: One Layer Wednesday (OLW89) ~ Schweet! One Layer Wednesday (OLW89) ~ Schweet! Happy Memorial Day to my fellow Americans! In my day we loudly objected to the war in Vietnam, but we never lost sight of the fact that we had the freedom to do so. Nor was it ever intended to be disrespectful of the services; quite the contrary. God bless those who have served and continue to serve and God bless their families. Today I feel like I've done the last of the catching up I wanted to do with a card for the One Layer Wednesday challenge. This week the challenge is hosted by the fantabulous Cheryl Emery. I wish more of you would play with us. Even if you think it is too simple or too easy, who doesn't like a few simple, yet beautiful cards to have on hand? And if you think it's too hard, you know what they say, stepping out of your comfort zone is good for you. They say it, I never did. I just want to join in as many different challenges as I can because I find it makes my brain cell fire up. You do whatever inks your stamp! The theme for this week is something sweet. I love all the fruity, ice-creamy, cupcakey ideas that are already linked, but I went in a different direction. What's sweeter than a weddle baby?! I noticed the first photo looks too washed out; now the second one no longer looks pink like it is IRL. Oh vell, at least you can see the booties are embossed. While doing major yardscaping yesterday, I found a boy toy (I wish) in the vinca. I immediately named him Dino, but of course, and set him up on the wall so Lizzie can have a playmate. I would be so elastic if I ever manage to get a picture of the two of them together! I'm aware that I'm having a doover of my childhood in my dotage. I think if your first one wasn't all that great, the least you can do is have another go at it. 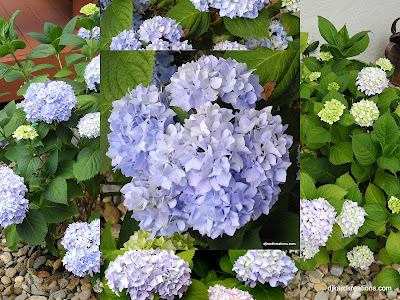 And finally, I wanted to share my two little hydrangea bushes with you. I love how this year I'm getting a full range of pastel colors in the beautiful blooms. I love them almost prezactly as much as I love lilacs. Oh what a sweet baby card! Gorgeous hydrangea too, ours is nowhere near flowering yet! Those are some sweet baby shoes, Darnell, and beautiful hydrangeas! I have one and it's in full bloom. I need to get a picture. Sweet little baby shoes. I'll have to check out that challenge. There are so many, I'm just starting to figure it all out. Gorgeous hydrangeas! Thanks for sharing and hope Lizzie finds Dino soon. You are too funny! A boy toy... LOL! Gorgeous hydrangea’s, by the way. I like your take on sweet cards! Beautifully done! You're right, nothing is sweeter than a baby, UNTIL they become a TEENAGER, that is! Your card is sooo sweet. I love the tiny baby bootees, they're so cute. Just checked out the One Layer Wednesday challenge - looks good. May just have to start joining in. One layer's not always easy, but i like a challenge. Love the dinosaur you found, could become a great little friend for Lizzy. A photo of them together would be fab.